Toys R Us and Babies R Us of course has some Boxing Day deals! For those of you with an infant or toddler, on the Toys R Us side you can get 30% off ALL Little Tikes Infant and Preschool toys! A great time to purchase some of the higher priced necessities! The company is still offering FREE shipping on orders over $100 (some exclusions may apply). 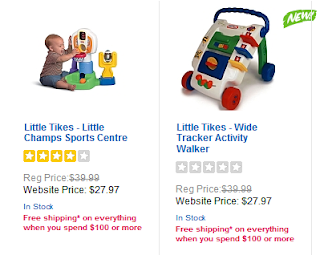 Check out these deals and more at www.ToysRUs.ca or www.BabiesRUs.ca. 0 Response to "Boxing Day Deals at Toys R Us / Babies R Us"